As most of you know, we are growing out of our space and are hoping to eventually purchase land and build a new temple to the glory of God. Meanwhile, we are realizing this vision piece by piece. We have had many church furnitures made which we will be able to bring with us to the “new church.” We have some new vestments, a processional cross and new fabrics for the icon stands and the altar. 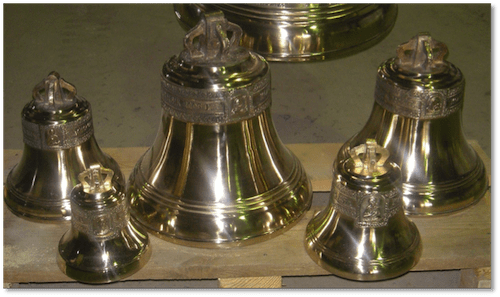 As long as we are at the Newman Center, we will only use two or three of the bells (which we will bring inside after the services). Please note that this is a beautiful long term investment for our parish. We would of course buy bells regardless once we build the new temple, but this will give us a head start, and the joy of hearing the peal in our services! Total cost for all 5 bells: $11,596. If you are curious as to how this peal sounds (using all five bells), play the files below. If you would like to give towards the bells, please make your check our to “St. Gabriel the Archangel Orthodox Church,” and clearly specify in the memo line that your donation is for the church bells. You can also use the online donation system, but make sure that you designate the gift for the bells. This is a fundraiser, and as such your regular tithe should not be directed towards it.